What Would Happen if an Asteroid Hit the Earth? What Can You See with a Telescope? According to NASA, we are merely 20 years away from finding alien life. No longer does ET belong to the realms of science fiction. Here’s why. Two years ago, NASA’s then chief scientist Dr. Ellen Stofan made a bold statement (55:24 in the video) pertaining to the existence of extraterrestrial life. According to her claims, we’ll find definitive evidence of its existence within the next 20 to 30 years. It might sound hopeful, but given the rapid advancements in space exploration in recent years and the fact that we’re discovering new planets every month, finding alien life is, for the first time in human history, finally within our reach. What’s more is that alien life quite possibly exists right on our cosmic doorstep, as close as Jupiter’s moon Europa. Rocky, terrestrial worlds, are common throughout the Universe, but they’re still extremely difficult to detect at such vast distances. Throughout most of the space age, the only planets we knew of were those in our own solar system. Although scientists had long assumed that other stars hosted planetary systems it was, for decades, extremely difficult to detect these relatively tiny objects trillions upon trillions of miles away. However, that all changed with the confirmation of the existence of two pulsar planets orbiting a stellar remnant 2,300 light years away. There are now more than 3,600 extrasolar planets known, with more being discovered every month. Given the rate of discovery, it seems reasonable to assume that the clear majority of stars in the Milky Way galaxy (and any other galaxy for that matter) have at least one planet, which would make for a minimum of around 200 billion planets. Probability alone suggests that at least 11 billion of these planets may be potentially habitable, since they would orbit within the habitable zones of stars like our own. If red dwarf stars were to be included as possible habitable systems, the number increases at least four-fold. While the existence of sapient lifeforms is far less likely, at least in our local stellar neighbourhood, it just seems like common sense to assume that microbial and even macroscopic life is common throughout the Universe. However, while we now know that extrasolar planets are incredibly abundant, no one is suggesting that life can only exist on a planet. In fact, extraterrestrial life might not even be earth-like in the slightest. Given the right conditions, there’s no reason why microbial life, or perhaps even macroscopic life, can’t exist on a moon, such as our own solar system bodies Europa and Enceladus. With water in great abundance, these otherwise icy outer solar system bodies are believed to have vast underground oceans kept liquid by tidal heating from Jupiter and Saturn respectively. On April 6, 2017, scientists managed for the first time to detect an atmosphere around an Earth-sized exoplanet. The search for extraterrestrial life is all about identifying biosignatures. These are the imprints of life as we know it, imprints that we can observe from enormous distances which, in the case of extrasolar planets, run into dozens or even hundreds of light years. However, we now know what to look for and where to look for it. For example, we can identify biosignatures of earth-like in the form of lines on the electromagnetic spectrum. These can reveal crucial insights into the atmospheric compositions of far-off planets. Just a few days ago, a study published in the Astronomical Journal revealed that scientists had discovered chemical signatures in the form of spectral imprints in the light originating from the planetary system. These findings showed the Earth-sized world GJ 1132b to have a dense atmosphere that may be composed of either steam or methane. While the planet is not likely to host life given its average surface temperature being estimated at 370°C, the findings do illustrate the fact that we now have the capability to explore atmospheres in planets many light years away. The James Webb Space Telescope will explore the deepest space from its position some one million miles away at Earth’s Lagrangian 2 point. Next year, the James Webb Space Telescope will be launched into space where it will observe the skies from around one-million miles away. One of the primary goals of this incredibly ambitious piece of hardware is to use its spectroscope to analyse alien atmospheres. With the ability to identify chemical components in atmospheres, Webb may, all by itself, be responsible for finding the first truly compelling evidence of a planet being habitable. For example, if there is ozone, methane or any other promising biosignatures in the TRAPPIST-1 system Webb will be sure to let us know. Webb will also be able to able to detect more planets than its predecessors. The Europa Clipper will be equipped with the means to detect any biosignatures in Jupiter’s moon Europa. Planned for launch around 2022, the Europa Clipper will also be on the hunt for life-bearing conditions, albeit much closer to home. With the goal of confirming the existence of and studying the composition and potential habitability of the Jovian moon’s subsurface ocean, the mission should reveal any potential biosignatures if they’re there. For example, if a geyser of water vapour strong enough to break through the granite-hard icy crust erupts from the subsurface ocean, the probe should be able to determine its chemical composition. If, after all, there’s life on Europa, any water vapour plumes erupting from the surface should be full of organic matter. NASA’s next (so-far unnamed) is slated for launch in 2020 and should be able to collect samples for possible return to Earth. 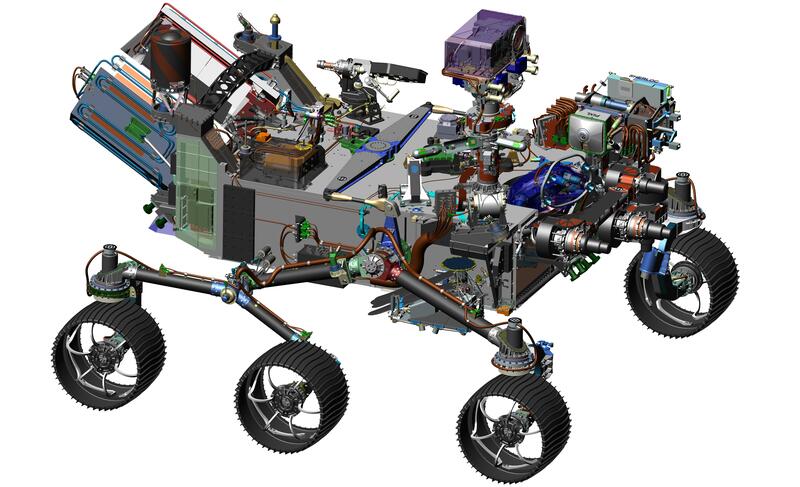 NASA is also planning to send its next rover to Mars in 2020. The rover will be equipped with a powerful, ground-penetrating radar and a chemical spectroscope to search the Red Planet for organic molecules belonging to either past or present life. While we all know that Mars is inhospitable in its current form, it is widely believed that it once had a thicker atmosphere, an abundance of ocean coverage and a magnetosphere to ward off life-destroying radiation. Although any such life would probably be microbial, its discovery would mean that life, at least in a simple form, is likely abundant throughout the universe. I’m confident that, once the James Webb Space Telescope launches next year, we’ll be in for some ground-breaking revelations. For the first time in our history, there is a very real possibility that we will find definitive evidence of the existence of alien life, either among the stars or right here in our own solar system. I think it’s fair to expect that exoplanet discoveries will also increase exponentially in the coming years, potentially giving us even more places to look. Where do you think we’ll first find alien life? Let me know in the comments below! Welcome to Earthly Universe, an online magazine featuring articles about the natural sciences ranging from the wonders of the cosmos to the secrets of the ancient Earth.